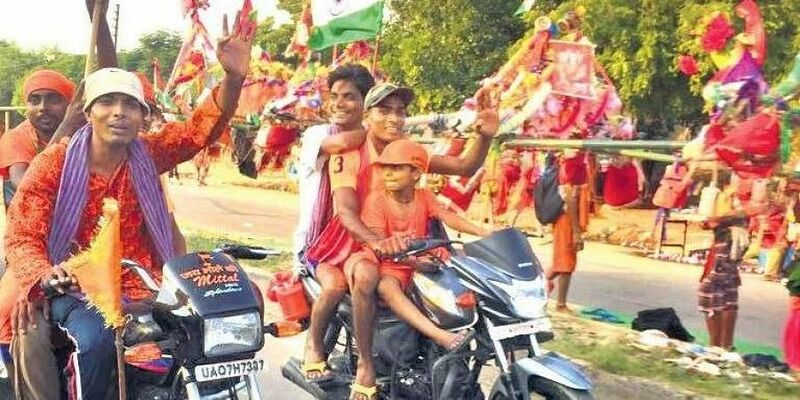 LUCKNOW: The famous ‘Kanwar Yatra’ commencing on Friday will have an added attraction this year as the outfits like Vishwa Hindu Parishad (VHP) and Bajrang Dal are contemplating to carry a specially designed model of proposed Ram Temple in Ayodhya as a Kanwar during the yatra which is taken out in the month of ‘Shrawan’ by the Shiva devotees through western UP. Notably, the yatra (a religious procession) and one of the biggest religious events in communally sensitive western UP, takes off on the first day of the month of ‘Shrawan’. This year it will begin on July 27 and continue till August 9 this year. During the yatra, lakhs of devotees go to Haridwar to fetch Ganga water and return with water carried on their shoulders in jars and cans and offer it to deities at Shiva temples in their localities on the day of Shrawan Shivratri which is falling on August 9. As per the Bajrang Dal sources, the special Kanwar modelled as Ram Temple is being designed in Haridwar. Around 300 volunteers of VHP and Bajrang Dal are expected to carry this special Kanwar to Meerut. It will measure around 250 ft by 25 ft. Besides, kanwars on other religious themes would also be carried by the activists of the two outfits along with the yatra. Moreover, Dharam Jagran Manch of RSS is also expected to depute around 30,000 volunteers along the Yatra route to help the Kanwariyas. In all, the seven districts of Meerut zone, including Meerut, Hapur, Baghpat, Muzaffarnagar, Ghaziabad, Saharanpur and Shamli, are communally sensitive and have been prone to tension during Kanwar yatras in the past. Meanwhile, the state government as spruced up the police machinery in western UP and heavy security arrangements have been made to ensure smooth passage to Yatris. “All the district administrations and police will be on toes in the light of the Ram temple Kanwar being a part of Yatra this year,” said a senior police official. The UP government has decided to deploy UP 100 emergency police response vehicles which will accompany the yatra. Even drone camera will also be put to cover the yatra in order to avert any untoward incident during the two-week-long event.